As slow-burning rhythm game DJ Hero steams towards 2 million units sold, the title's creative director thinks anyone who calls it a failure is "f*cking mad." Last fall, DJ Hero saw a less-than-stellar launch with consumer demand "well below" expectations. Though publisher Activision had originally said that it expected the game to be a slow starter, it seemed like the gaming public had written it off as a flop. As it turned out, the prediction that DJ Hero would be a slow burner turned out to be completely accurate: The disc-spinning rhythm title went on to sell over a million units. With sales of the title now steadily creeping towards two million, developer FreeStyleGames' creative director Jamie Jackson thinks that they've had the last laugh. Speaking with Videogamer, Jackson gave his opinion on the game's perceived failure in no uncertain terms. "We're at over 1.6 [million], pushing towards 2 [million] now, which is cool," he said. "If anyone had said me to me when I was starting my career in the industry that you'd work on a game that sells that many copies and it would be considered a failure I'd have said 'are you f*cking mad?' And I still probably stand by that now." A common criticism of DJ Hero that Jackson does agree with involves the game's price point. The initial launch price of $120 was much too high, he thinks, and sales of the game rose whenever the price was slashed. "We definitely had spikes around when there were price drops," he admitted. "My own personal opinion is that it was too expensive when it was first released, and we're addressing that this year - it's going to be cheaper when it comes out this year." It didn't help, of course, that the economic recession was in full swing during the game's launch. "So, you know, people were suddenly watching their pennies and then the game came out and 1) it was new and 2) it was expensive." Given that DJ Hero was generally well-received by critics (including yours truly) and most everyone who actually played it, I think that Jackson is well within his rights to be frustrated that people think his game was a failure, don't you? 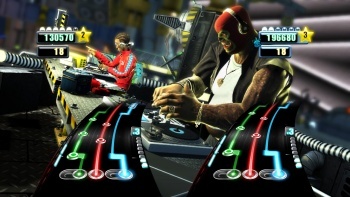 DJ Hero 2 is slated for release October 22nd with a fairly awesome-looking lineup of musicians under its belt.